The same as the late president Ferdinand E. Marcos’ quest for Sabah claim, the president vows to continue it through bilateral agreements first. However, that is changing due to the recent deportation reports of around 7,000 Filipinos from Sabah. 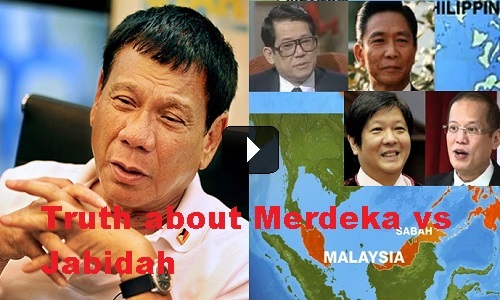 In fact, operation Merdeka (Freedom), was hatched by Marcos’ armed forces. The uprising is supposedly the excuse for the Philippine military to invade Sabah, which is originally owned by the Philippines had declared to be part of its territory. At that time, the country’s military is more powerful than that of the Federation of Malaysia, founded only in 1963. [VIDEO]: Excerpts of the Discussions of Dr. John Ortiz Teope and Atty. Homobono Adaza..
Then-senator Benigno “Ninoy” Aquino, Jr., who aspires to replace Marcos as president debunked the allegation of a Jabidah Massacre from the very start. His statements on this are preserved in the records of the Senate as his privilege speech delivered March 28, 1968. That cannot be denied by his son, former president Noynoy Aquino. The Jabidah myth is so successful that even President Benigno S. Aquino in his Bangsamoro Basic Law falsely compared the Mamasapano massacre of 44 police commandos to the nonexistent “Jabidah massacre.” His ignorance is a mockery to the fallen heroes of the nation. His incompetence actually caused their deaths as the commander-in-chief. Moro National Liberation Front (MNLF) used the false Jabidah allegation to trigger Muslim youth’s anger to rally their demands. The MNLF’s (Moro Islamic Liberation Front) Misuari also portrayed it as the collection of genocidal attacks against the Moros; to press that a Bangsamoro—an independent nation-state of the Moros is necessary. They currently put a stop on the ceasefire with government forces. This is after the president warns them that they will be pursued if they give refuge to terrorists. They are the players of Aquino’s lies and has nothing to do with the Sultanate of Sulu, the heir of Sabah.